In lieu of flowers, memorial gifts may be made to Lutheran Church of Hope, Ankeny, Iowa. 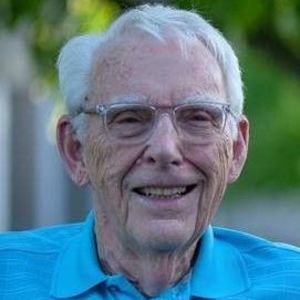 J. Marvin Rankin passed away in Milwaukee, Wisconsin, Friday, November 23, 2018, surrounded by his children. A funeral service will be held at 12:00 p.m., Thursday, November 29, 2018 at Lutheran Church of Hope in Ankeny. A visitation will be held 9:30 to 12:00p.m., with a Masonic Rights service will be held at 11:30 on Thursday, November 29th prior to the service. Marv was born June 16, 1928 in Delta, Iowa. He met the "best decision he ever made" Lorraine, while corresponding with his army buddies' cousin while he was serving during the Korean War. They were married October 10, 1953 in St. Paul, Minnesota. Marv was the Manager for John Deere Credit Union for over 35 years. Marv loved playing cards, tending to his tomatoes, and Sunday night popcorn. He loved traveling in his motorhome and being active in the Holiday Rambler Recreational Vehicle Club for over 50 years. His greatest joys were his children, grandchildren and great-grandchildren. Marv was preceded in death by his wife, Lorraine on July 18, 2018. He is survived by his five children; Pat (Mike) Sperry, Carol (Kirby) List, Jim (Terri) Rankin, Tom (Sandi) Rankin, and Jean (David) Walkup. Grandpa Marv will be forever remembered by his 12 grandchildren: Eric, Allison, Jordan, Mitchell, Nathan, Kyle, Ryan, Paige, Sam, Matthew, Holly, and Carly and four great-grandchildren: Neil, Harvey, Scarlett, Jackson and one great-granddaughter on the way. Marv is also survived by his brother Herb (Nadine) Rankin and Sister's Maxine Crane and Nancy (Laurel) VanderPol. Prayers for the family at this time. God's blessings to all! Known Marv since I was 8 and delivered him his morning paper. Always tipped me with a silver dollar at Christmas. Enjoyed working with him when he ran the credit union and I had the Press Citizen...and then later when we both worked at Iowa Realty. He was one of the world's good guys. a super nice son named Jim. My heart goes out to you Jim. Sorry for your loss Carol, you and your family will be in my prayers. My first boss and a great guy to work for at the credit union. Prayers to his children, which he talked about often. God has His arms around each of you. Marv and I were classmates at the Capitol City Commercial College that was located in Des Moines, Iowa. We wee also both employed by the John Deere Des Moines Works. A truly great friend, husband and father.